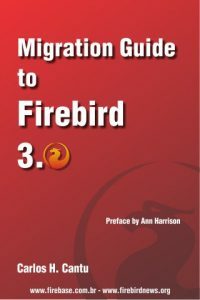 Being a Firebird consultant and a well known person inside the Brazilian Firebird community, I always get some complains from Firebird users, mostly from software developers who uses Firebird in their products, when they are prompted by some end users (companies) arguing about the adoption of Firebird instead of other databases, like Oracle or SQL Server. Some of them never heard about Firebird, and some of the others usually has the wrong idea of Firebird being a RDBMS capable of handling just small databases. Of course, all of us (developers) know that Firebird is a great product and CAN handle big databases, but we also know that the “big guys” have much more marketing presence, and this makes a real difference here. The best answer I can give to those people is to show some big/famous company names or products who are actually using Firebird, as well “big” examples of Firebird usage, with many gigabytes databases and/or thousands of connections. Yes, we have probably thousands or millions of products around the world using Firebird, but I’m speaking about specific big scenarios here. Unfortunately we don’t have too much information about this. Many big companies are afraid to share information about the technology they use and this is a problem. Anyway, I think that some of those minds can be changed. We don’t need to know any secret info, we just need some good technical numbers to show to the public. Please note that you need to be authorized to give me this info. I’ll not be responsible for the veracity of the submitted info and I will only include in the list the information given from a valid user (with complete name and valid email address). If you need to keep the company name in secret, I can add it to the list as “anonymous”, but your email and name will be published so people will know it is a valid information. I hope to get many submissions. Requested information (most of the fields are optional, but try to fill all of them) – copy/paste the information below into an email, fill it, and send it to me. PLEASE DON’T SEND INFORMATION ABOUT PROJECTS THAT DOESN’T FIT IN THE CRITERIAS DESCRIBED ABOVE, OR IT WILL BE IGNORED. Note that submiting this information you are authorizing it to be included in a public list that will be available freely on this or any other Firebird related site in the Internet. Pingback: Firebird News » Who uses Firebird?